There will be a bus for swimmers leaving the Salthill Hotel on the morning of the swim. Your bus departure time will be provided at the pre-race briefing on Friday night and will depend on which Swim Wave you are assigned to. For those driving to the Start, please allow at least 1.5 hours driving time. There will be temporary PortaLoo toilet facilities at Aughinish. The bus will not have toilet facilities. Please use the facilities in Salthill before the bus departs. Note: There is limited parking at the start line due to the narrow access road. If you are driving across, please do not block the road when parking as the bus transporting swimmers needs access to the start line. There are also local residents living on Aughinish island so please do not block access to any roads/property. 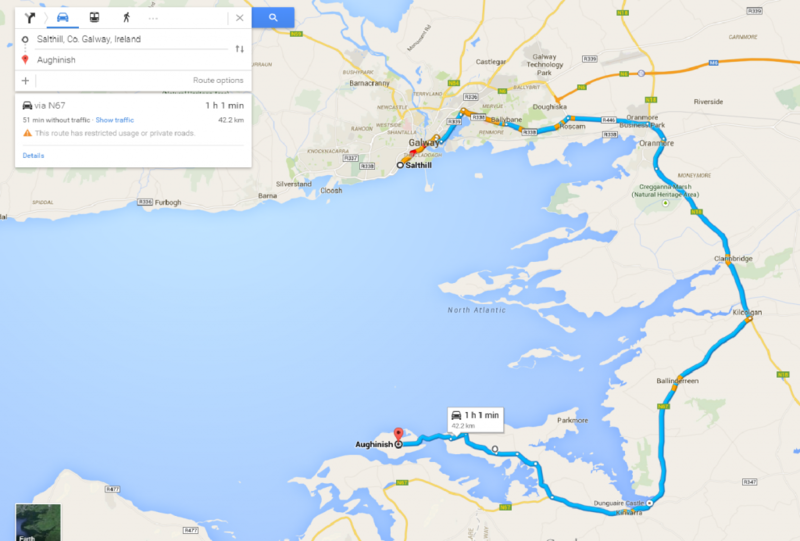 For those driving to the Swim Start, follow these directions from Salthill. Depart Galway on the N18 heading towards Limerick / Shannon. You will pass by Oranmore and through the village of Clarenbridge. At the next village Kilcolgan, take a right turn onto the N67 towards Kinvara. Follow this road for approx 1.5 km and turn left at the thatched white cottage. Bear left at the next Y junction. Follow this road for approx 2 km and take a left at the next T junction. Follow the road to Aughinish where you will see the causeway and the Martello tower in the distance. Drive across the causeway into Aughinish Island. The start is at the beach on your right, on this side (East) of the Martello tower you will see in the distance. 1) Approx 2km after Kinvara, turn right for Traught beach, Knockgarra. 2) Follow this road for approx 1.5 km and turn left at the thatched white cottage.